Please be prepared to provide a copy of the front of the front of your driver’s license or valid photo ID, a copy of your registration, and insurance with minimum policy limits of $100,000. Must be 18 years or older to purchase memberships online. Under 18 years old will need parental consent and can purchase memberships at these store locations or mail-in membership. Did you know that you can pick up your permit at various locations in Pennsylvania or mail-in the permit form? Click here for store locations OR Click here to mail-in your permit. This is to certify that I am a Parent/Guardian with legal responsibility for the above named Minor Participant, and I further do consent and agree to the Minor’s release of Famous Reading Outdoors, LLC, Reading Anthracite Company, and their respective shareholders, employees, owners, members, insurers, agents, representatives, affiliated entities, and all other Released Parties from and against any and all claims, demands, actions, costs (including but not limited to reasonable attorney fees), damages, liabilities, expenses and/or judgments which are or may be related to, directly and/or indirectly, and/or arise out of from Minor Participant’s use of the Access Permit and/or any activities incidental thereto. I further agree that this Release includes any and all current and/or future claims and/or causes of action, foreseen and/or unforeseen, that may be raised by the Minor Participant, myself, and our respective heirs, personal representatives, next of kin, relatives, successors, and/or assigns. I acknowledge that I have read and understand the terms and conditions of the attached Access Permit with Release and Indemnification and by my signature and initial hereon, I acknowledge that I am authorized to sign this certification and that I approve of and agree to the same (Access Permit with Release and Indemnification together with any and all other documents and/or agreements related to Minor Participant’s use of the Access Permit) on behalf of the Minor Participant and as if I was original signatory to any and all documents signed by the Minor Participant. PLEASE NOTE: Memberships are issued per person NOT per vehicle. 1. This Access Permit is valid for calendar year 2019. This Access Permit shall terminate at sunset on December 31, 2019 unless FRO terminates this Access Permit earlier.2. Access Permits are non-transferable and non-assignable. If FRO determines that this Access Permit has been used by any person other than the Permit Holder, this Access Permit shall be immediately terminated and the Permit Holder will forfeit this Access Permit for the remainder of the calendar year. Further, the Permit Holder agrees that he or she will be banned from purchasing another Access Permit in the future. The Permit Holder understands and agrees that any person found to be using this Access Permit without signing for it will be prosecuted under the laws of Pennsylvania and for trespassing on FRO leased property and/or property owned by Reading Anthracite Company (“RAC”). FRO currently leases certain real property from RAC, which is set forth on Exhibit “A” (“FRO Properties”). 3. This Access Permit provides Permit Holder with permission to be on FRO's Properties between sunrise and sunset, excluding those properties where there is active mining or any other working facilities or any posted properties by FRO, RAC, and/or any other entity. The Permit Holder must have this Access Permit displayed on their dashboard of their vehicle at all times; otherwise, any vehicle without a valid Access Permit will be towed at the Permit Holder’s sole cost and expense. The Permit Holder must have a separate permit from FRO on them at all times, which must be visible on the Permit Holder and/or any off-road vehicle they are operating on FRO Properties. The Permit Holder agrees that he or she may not enter FRO Properties prior to sunrise and/or remain on FRO Properties after sunset. This Access Permit does not grant Permit Holder access and/or any rights to enter onto any other property owned and/or leased by FRO, RAC, and/or any other entity of the Rich Family of Companies. a. No person shall park or store, nor shall any landowner permit to be parked or stored on any roadway, sidewalk or public ground within Foster Township any all-terrain vehicle. b. Upon a public highway, road or street, or on public parking lot not specifically designated for the use of all-terrain vehicles, except under the following situations. c. The supervisors, any police officer or law enforcement officer may authorize and limit the use of an all-terrain vehicle on a public highway or street when the need arises such as an emergency for transportation due to snow or other highway or special conditions. d. For groups of five or fewer all-terrain vehicles’ owner(s) and/or operator(s), on private property not owned, leased or under the control of the operator(s) unless the operator(s) have the express consent of the landowner, lessee or other person in control of the real property, except in the case of any emergency when other means of travel are not feasible or possible. 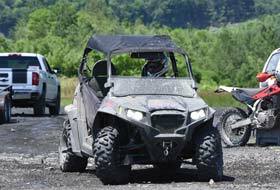 e. For groups of six or more all-terrain vehicles, on any private property within the Township of Foster not zoned as a racetrack/recreational facility. Any all-terrain vehicle who engages in such use and any landowner who permits such use without proper zoning shall be fined a minimum of $300 per occurrence up to a maximum fine of $20,000, plus court costs and any reasonable expenses involved in the prosecution. f. For groups of six or more persons camping on land overnight for the purpose of operating all-terrain vehicles, unless the land on which they are camping is zoned a campground. The landowner must provide restroom and trash collection facilities at the entrance(s) to the camping area(s) and meet all other requirements for land zoned as a campground. Any all-terrain vehicle operator who engages in such use and any landowner who permits such use without the proper zoning and/or facilities shall be fined a minimum of $300 per occurrence up to a maximum fine of $20,000, plus court costs and any reasonable expenses involved in the prosecution. g. At a speed greater than is reasonable and proper, having due regard for conditions then existing. h. During the hours from one-half hour after sunset to one-half hour before sunrise without displaying a lighted headlight and lighted tail lights. j. Unless such all-terrain vehicle is equipped with a muffler or baffle in good working order and in constant operation so that noise emission at fifty feet at right angles from the vehicle path under full throttle does not exceed 86 DBA (decibels on the “A” scale). k. Within one hundred (100) feet of a dwelling between 12:00 midnight and 6:00 a.m. at a speed greater than minimum required to maintain forward movement of the vehicle..
l. In any areas on which public hunting is permitted during the season open to the taking of deer with firearms from 7:00 a.m. to 11:00 a.m. and from 2:00 p.m. to 5:00 p.m., except during an emergency or lawful enforcement purpose, to go to and from a permanent residence or hunting camp otherwise inaccessible by conventional wheeled vehicle or for the conduct of necessary work functions involving land and timber survey, communication and transmission line patrol and timber harvest operations, or on the operator’s own property or as an invited guest of any owner or person in control of the that property. m. While transporting a bow, unless unstrung, or a firearm, unless disassembled, and securely encased or equipped with and made inoperative by a key locked trigger housing mechanism. n. On or across a cemetery or burial ground. o. On a railroad right-of-way, except for railroad, public utility or law enforcement personnel while in the performance of their duties. p. Unless it has at least one headlight, one tail light and adequate brakes capable or stopping the vehicle. I certify, warrant and represent that I have all required documentation for each Permitted Uses (as listed next to each Permitted Use) that I intend to use on FRO Property in accordance with the Access Permit. Further, I certify, warrant, and represent that all required documentation will be current and valid throughout the term of the Access Permit. While on FRO Property, I agree to have all required documentation on me at all times. Upon request from FRO, I agree to promptly provide copies of all required documentation. I certify, warrant and represent that I will maintain insurance with a minimum policy amount of $100,000 with a reputable insurance company authorized to do business in Pennsylvania on any vehicles I intend to use pursuant to the Access Permit. I agree to maintain such insurance throughout the term of the Access Permit. I agree to have proof of insurance on my person at all times while on FRO Property and/or using the Access Permit. I would like to pay with a Gift Certificate? Enter your unique gift certificate number. We will need your credit information even though your payment amount will be $0.